When Jan and Dave Griffith lost their beloved pet, an Australian cattle dog named Sophie Tucker, on a boating trip last November, they thought she was gone for good. The Griffiths' boat hit choppy waters near the coastal Queensland town of Mackay, and Sophie Tucker fell into the ocean. "We were able to [backtrack] to look for her, but because it was a grey day, we just couldn't find her and we searched for well over an hour," Mrs. Griffith told the Brisbane Times. "We thought that once she had hit the water she would have been gone because the wake from the boat was so big." The couple was devastated. Sophie Tucker, on the other hand, went into survival mode. She swam five nautical miles to St. 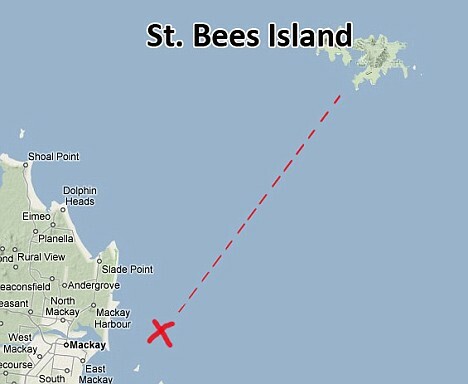 Bees Island, where her wild instincts kicked in -- she spent the following months surviving on a diet of wild goats and gaining infamy among the island's few human residents. Last week, rangers caught the dog, whom they assumed to be feral. But news reached the Griffiths that a cattle dog had been found on St. Bees, and they contacted rangers to see if it could be Sophie Tucker. Long story short: It could! "We called the dog and she started whimpering and banging the cage and they let her out and she just about flattened us," Mrs. Griffith recalled of the reunion in an interview with the Australian Associated Press. "She wriggled around like a mad thing." Although Sophie Tucker (who's named after the Vaudeville star) had become vicious during her months of feral living, her owners report that she has successfully made the transition back to "house dog" (and is enjoying the luxury of air conditioning).